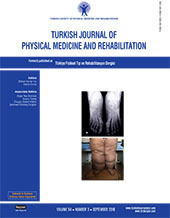 2 Department of Physical Medicine and Rehabilitation, İstanbul Memorial Hizmet Hospital, İstanbul, Turkey DOI : 10.5606/tftrd.2018.1685 Objectives: The aim of this study is to investigate the reliability and validity of Duruoz Hand Index (DHI) in patients with carpal tunnel syndrome (CTS). Patients and methods: A total of 55 patients (50 females, 5 males; mean age 51.0±10.2 years: range, 30 to 73 years) aged ≥18 years who were admitted to the outpatient clinic of a rehabilitation hospital between December 2010 and December 2012 with the diagnosis of CTS both clinically and electrophysiologically were included in this study. All patients completed DHI at baseline and repeated after a week interval. The Boston Questionnaire (BQ) and Health Assessment Questionnaire Disability Index (HAQ-DI) were filled out at baseline. And the internal consistency reliability was tested using the Cronbach`s alpha. For the test-retest reliability, intraclass correlation coefficients (ICC) were calculated. The correlations between the DHI and both BQ and HAQ-DI were investigated for the construct validity. Results: Of the patients, 41 (74.5%) were housewives. Carpal tunnel syndrome was bilateral in 29 patients (52.7%). The Mean Body Mass Index was 31.2±5.5 kg/m2. The mean symptom duration was 22.8±23.7 months. The mean DHI scores for the first and second evaluations were 23.25±20.64 and 20.45±20.07, respectively. The mean BQ symptom severity and functional status scores were 2.87±0.80 and 2.72±1.03, respectively. The mean HAQ-DI score was 0.91±0.66. The Cronbach`s alpha was 0.97 indicating excellent internal consistency reliability. There was a statistically significant correlation between the two measurements of DHI. The ICC value for total score was 0.88 indicating good reliability. There was a statistically significantly positive correlation between the DHI and BQ (r=0.638, p<0.001). Also, DHI was significantly correlated with the HAQ-DI (0.613, p<0.001).